"Stacking Silver Bangle Bracelet, Words to Live By"
Encouragement jewelry and inspiration gifts can bring you or someone you know constant joy. Choose a word or short phrase to create a custom bracelet with words, names, dates or short phrases that will remind you of the joy of life. Do you or someone you know need a simple reminder of what you have to be thankful for? 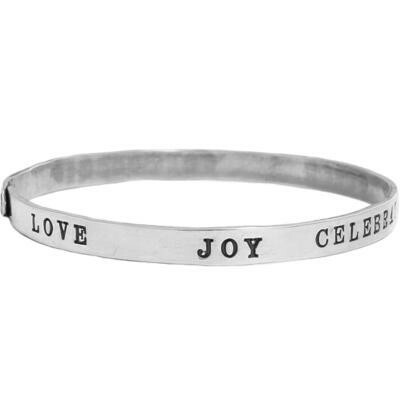 Create a custom bracelet with words to encourage, inspire or bring you joy. You can stamp a name, date, nickname or any other 12 character sentiment on the inside and up to 6 words on the outside. The price listed is for one inside stamp and one outside stamp. The price will change according to how many stamps you put on the bracelet. All stamps will be spaced equally around the bracelet. If you are just ordering two words/names we will stamp them about a half inch from the center point. Using the block font there is an 8 character limit. If you need more than 8 characters we can do it using the Lizzy font but you will need to call us at 978.792.2555. Because these bracelets are customized, all sales are final.